Thanks for this post on widgets. 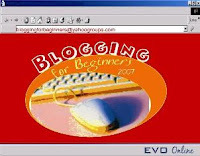 You've said all that our beginners bloggers should take into account when using them on their blogs. You're right when you say that we may fall into the temptation of using new gadgets as soon as we find something attractive in somebody else's blog, just for fun. But it may have nothing to do with the spirit with which the blog was created. You make a good account of the purpose behaind each widget you use, and that's the kind of reflection we'd like to promote at B4B. Thanks also for not minding my using your blog as an example even when I forgot to ask you. I'll refer B4Bers to this post on the list. I hope we'll get many interesting comments. And finally, thanks for your contribution to the discussion and to our widget list. Wow, oh, ah, Claudia! Your post is so complete, informative and impressive that I'll need to write a whole post to organise everything I wanted to "say" as I wnet through each section! I promise I'll come back here anpost a direct link to that entry as soon as I can afford to post it. For the time being, I didn't want to put off saying THANKS!!!! No need to apologise. Linking is nettiquette enough. Let me congratulate you both and all the B4B blogging team -Silvana, Carla and Erika- for the task of titanic proportions you are doing there. Until last month my blogging was an inward journey sometimes exposed to the world in posts. I've come a long way on my own. However, getting in touch with the ELT world community is making all of this much, much more enjoyable. My pleasure to have you both as commenters in my blog. Hi Claudia C., what an excellent post you have here. It is very true that there is a stage when we tend to grab any widget we find and simply embed it in our blogs. I do that in my two personal blogs to experiment tools and how they work but feel it would be inappropriate for class blogs that have a very specific purpose in mind. Widgets are fun, though, and I bet students would love to play around with them. So to find a balance between what to use from what is available and free requires further a clear idea of the course objectives, students´needs and blog purposes. Thanks for sharing. You have moved the right piece in the chessboard here. Widgets contribute to the entertaining part of the online experience we propose to students. Let's face it: our employers are not including blog assisted lessons on our responsibilities checklist. Most of us teacher bloggers take to blogging because we have discovered a ground where the line between work and play is blurred. Better not forget that the nature of informal learning is serious stuff! So Dan, I must admit my post is by no means exhaustive. Perhaps some additions on positive aspects of widgets would be in order.